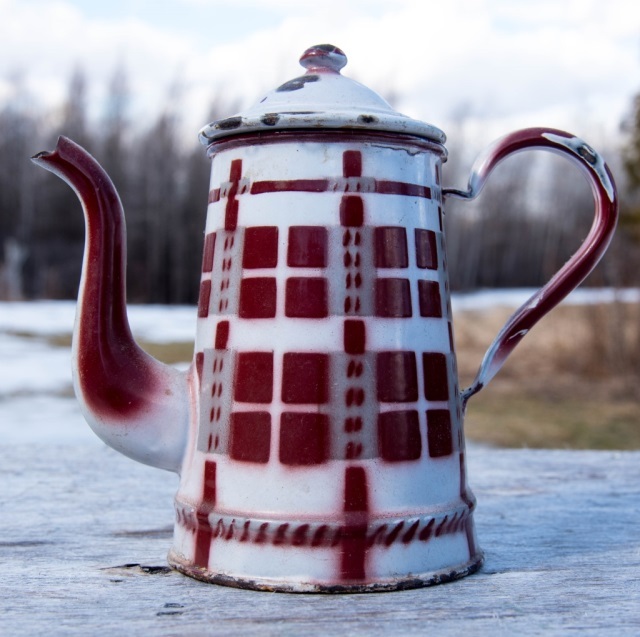 I was enjoying looking over all the fantastic offerings coming up at Colin Latreille’s April 1st auction when I came upon listings for 4 French enamelware coffee pots, and it brought to mind the many pieces of Enamelware we had brought here over the years of importing from France. Canadian enamelware was one of the first things Jeanine introduced to me as something she would like to collect, and although at first it I’ll admit it was kind of lost on me, it didn’t take me long to gain an appreciation, and find enjoyment in the hunt. 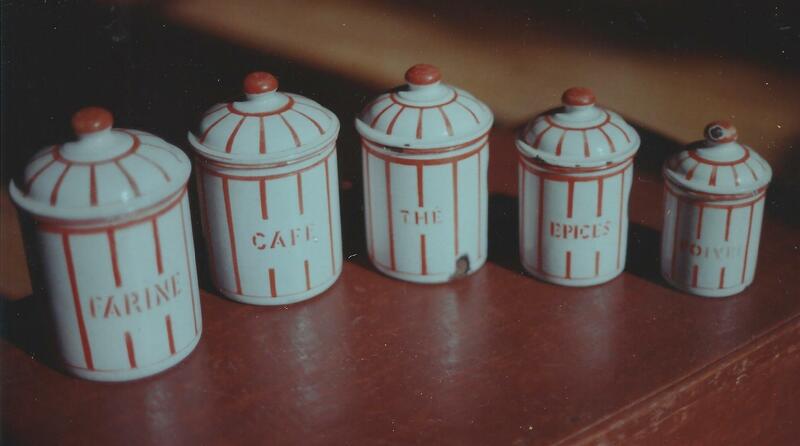 Enamelware represents a gentler, more Romantic time, when even the most humble item was beautifully made. 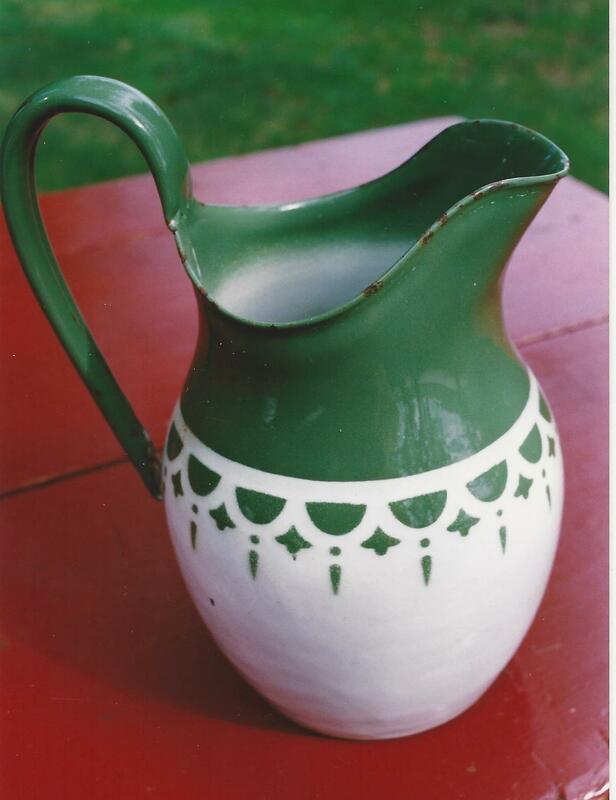 Less expensive and more durable than pottery, it served to some degree in the most kitchens and households from the late 1800’s until the mid-20th century. Much of it was plain white with a colored boarder, especially in North America, but for a few cents more you could buy one with an applied décor. This was especially the case in Europe were factories in France, Belgium, Germany, England, Poland and Denmark produced work that came in a wide range of Pastels such as Pink, Aqua, Light Blue, White, but also in vibrant Reds, Blues, Yellows and Oranges. There are many variations of Victorian, Art Nouveau or Art Deco designs. Many pieces contained a shading of the design which was done by “aerography”, an early form of air brushing technique. Some top-end pieces are even hand painted. A few pieces are labelled on the bottom but most are not, so although with a little experience it is easy enough to distinguish between North American and European pieces, it takes a lot longer to learn what factory might have produced an unmarked European piece. Weight is a clue. Polish wares tend to be lighter. Thickness of the enamel layers is another; and you would think when language is involved such as labels on storage canisters ,sucre, being French etc, it would appear obvious. However, some factories produced product for foreign markets so that really doesn’t prove anything. In any case, I think the priority of most collectors is a chosen design, form or color. Like any collection, at first you buy widely, whenever you see the stuff ignoring flaws, etc, but before long you start to recognize that you do not have an infinite amount of space to put all this stuff, and you begin to discriminate. When Jeanine started collecting Canadian enamelware it was anything blue on white, with a pleasant form, in good condition. 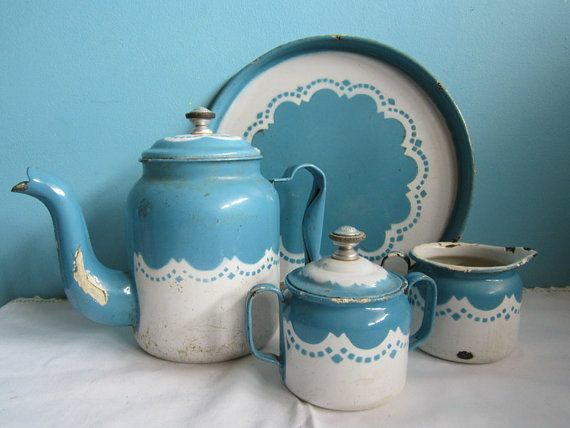 Eventually she narrowed her collecting to one blue and white pattern called “Bonny Blue” made by The McClary manufacturing company of London Ontario. It looked great spread across a long shelf up near the ceiling running the length of the kitchen. Then one day she decided that was it, and she sold it all off and started collecting Japanese biscuit barrels, but that’s another story and a woman’s prerogative. 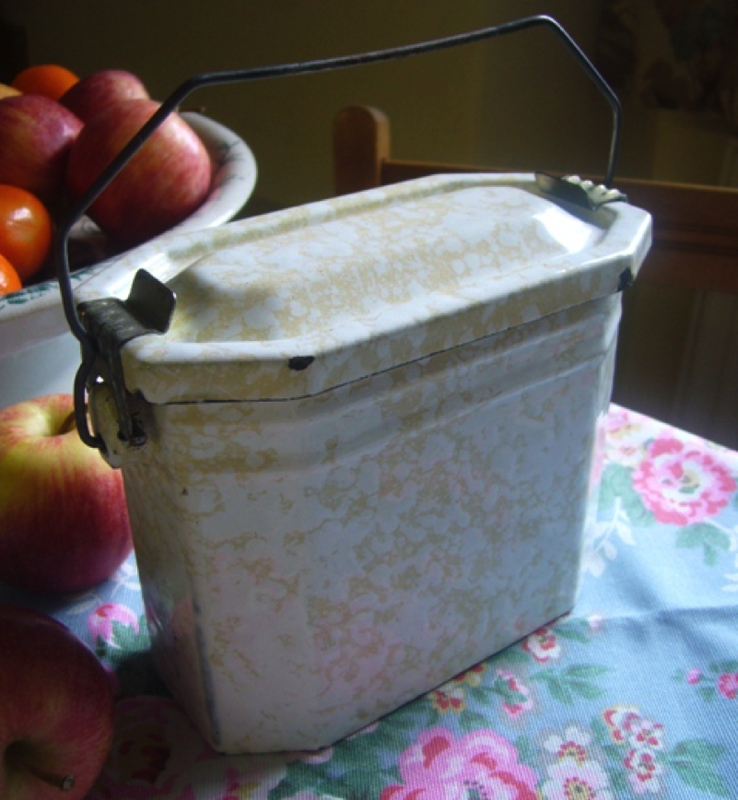 So when we started our combination family visit/ buying trips to France, although our priority was pottery, we would also scoop up any fine examples of enamelware we would encounter. And we would encounter it often, and most times it was dirt cheap. It’s interesting to note how many great pieces we discovered in the basements of fine antique establishments. Usually for not much money and thrown in a dark corner, but it illustrates, I think, that even a top-end dealer cannot resist something so fundamentally beautiful even if it doesn’t represent a big return on investment. Basically, it turned up everywhere. At the regular weekly markets, in the “depot/vent” or as we call them consignment shops, and at the “vide greniers” or “empty the attics” village yard sales. And even as I mention in the dark corners of some top end shops. It was fun to buy, and easy to ship, and we always found it sold fast back in Canada, even though it was sold as European. Not to collectors of North American enamel wear obviously, but to those who were starting to decorate in a French country style. Then, inevitably, over time people’s taste starts to change. In this case it was not here so much. More and more people continued to be interested in all things French; but there in France. After mostly ignoring it for years the French themselves became interested in the “country look”, and so the enamel wear prices rose quickly and availability became scarce. I still love the look of the stuff, and the way it makes me feel. A comfy feeling. Grounded. I also noticed last year that availably and prices in the French markets seem more favorable, but I don’t know about the market here. I expect it’s a bit of a hard sell, and of course the Euro exchange is a big factor. Still I’m going to be looking to see the results from Colin’s auction with a mind to future trips. There’s always a little room in the suitcase. 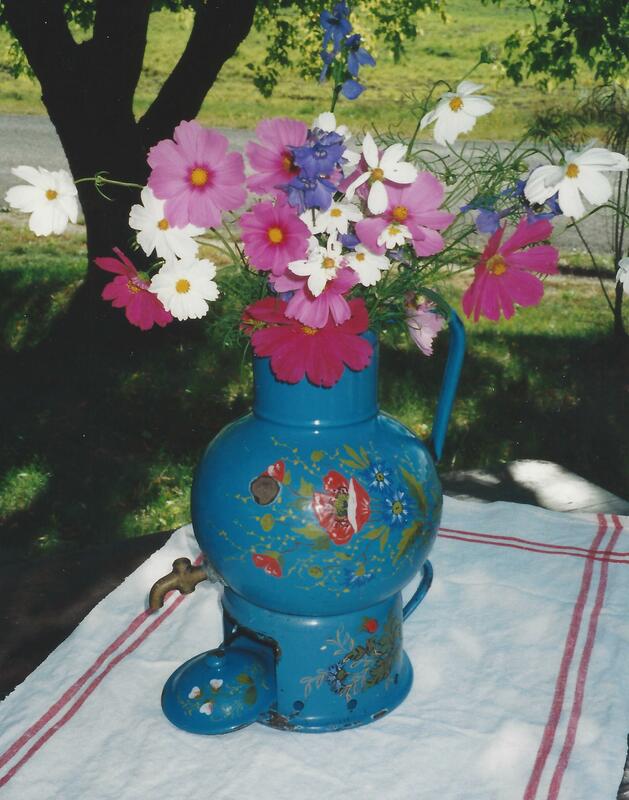 This entry was posted in Antiquing in France and tagged collecting enamel wear, enamel wear coffee pots, enamelwear, Fench country, Fench enamel wear, French enamelwear, McClary, McClary "Bonnie Blue" by shadflyguy. Bookmark the permalink. Beautiful pieces! I especially love that red plaid coffee pot!